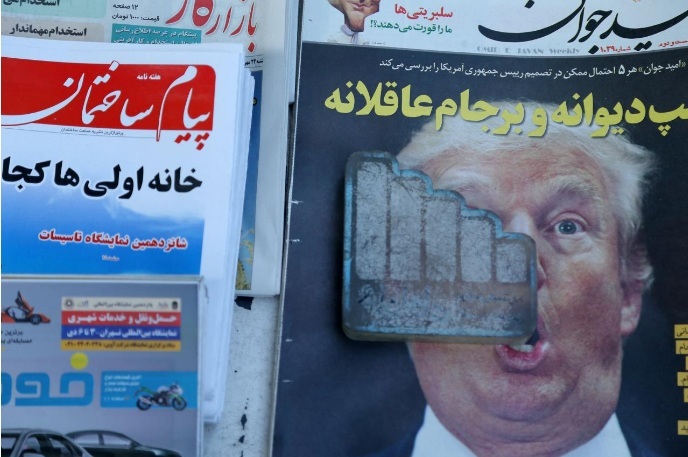 A newspaper featuring a picture of U.S. President Donald Trump is seen in Tehran, Iran, October 14, 2017. ANKARA - U.S. President Donald Trump’s hardened stance towards Iran evoked a mixture of indifference and national pride among Iranians on Saturday but many were concerned about economic hardship should a multinational nuclear deal unravel. In a major shift in U.S. foreign policy, Trump said on Friday he might ultimately terminate the 2015 agreement that lifted sanctions in return for Tehran rolling back technologies with nuclear bomb-making potential. “Who the hell is Trump to threaten Iran and Iranians? Of course we don’t want economic hardship, but it does not mean we will be their puppet and do whatever they say,” said housewife Minou Khosravani, 37, a mother of two in the central city of Yazd. Within minutes of Trump’s speech, Iranian President Hassan Rouhani went live on state television, ruling out any renegotiation of the deal Iran signed with major powers. He also signaled Iran would withdraw from the agreement if it failed to preserve Tehran’s interests. Tired of economic adversity during years of tough sanctions over Iran’s nuclear programme, many Iranians still fervently back the decision by Iran’s clerical rulers to resist U.S. pressure. “I am not a regime supporter. But I side with Iran’s rulers against Trump and his illogical pressure on Iran,” said hairdresser Ziba Ghanbari, 42, when contacted by Reuters in the northern city of Rasht. Iranians around the globe took to social media in anger. “Long on rhetoric, short on substance,” tweeted Niloofar Ghadiri, a journalist in Tehran. Iranian authorities say 15 percent of the country’s workforce is unemployed. Many formal jobs pay a pittance, meaning the true figure of people without adequate work to support themselves is probably far higher. Lack of foreign investment, if more sanctions are imposed, will deepen the unemployment crisis. Currency exchange shops are refusing to sell U.S. dollars because of the uncertainty as the rial has lost value in the past days. Iranians fear new sanctions will also see the price of food, including rice, bread and dairy products, rise. “My worry is that the economy will go back to the sanctions era when we had difficulties to find essential food and even medicine. I want my son to have a good life,” said elementary school teacher Gholamali Part, 43, in Tehran. To improve Iran’s economy, Rouhani has rolled out the red carpet for global investors since sanctions were suspended. But so far only a few major European investors have returned to Iran’s market, including planemaker Airbus, French energy group Total and Germany’s Siemens. Others are deterred mainly by a separate raft of sanctions Washington continues to impose in retaliation for what it calls Tehran’s support for terrorism and human rights abuses. Iran denies involvement in terrorism. The nuclear deal was also signed by China, France, Russia, Britain, Germany and the European Union. Despite assurances by other signatories over their continued commitment, European companies could think twice about involvement in Iran if the deal cannot survive. Hossein, like millions of Iranians who bore the brunt of the sanctions, has no high hopes. “We are going to be sanctioned again,” said Hossein, who declined to give his full name. Inflation has dropped to single digits since Rouhani was first elected in 2013, but he has failed to tackle high unemployment and the gap between rich and poor is widening. Some Iranians are indifferent. “I don’t care. Will there be holidays if the deal fails? That is important because I can go on a holiday with my friends,” said Arjang Bakhtiari, 19, whose family owns factories in several cities. Trump’s decision in effect leaves the fate of the deal up to the U.S. Congress, which might try to modify it or bring back U.S. sanctions previously imposed on Iran. The failure of the deal could be politically tricky for Rouhani, its chief architect, who has been criticized by the country’s utmost power, Supreme Leader Ayatollah Ali Khamenei, for the country’s slow pace of economic recovery. Khamenei cautiously backed the deal, but has repeatedly expressed pessimism about the United States remaining committed to it. The economic problems caused by the U.S. pressure could weaken Rouhani’s stance in Iran’s faction-ridden and complex establishment. U.S. President Donald Trump’s hardened stance towards Iran evoked a mixture of indifference and national pride among Iranians on Saturday but many were concerned about economic hardship should a multinational nuclear deal unravel.